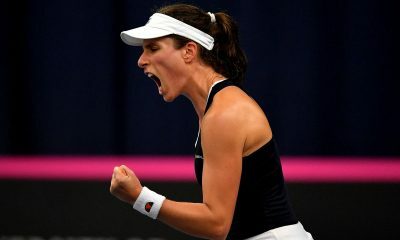 Johanna Konta led by example with a battling display to see off Greek No.1 Maria Sakkari and secure victory for Great Britain. Johanna Konta fought back from a set down to beat Maria Sakkari 3-6 6-2 6-3 and give Great Britain an unassailable 2-0 lead against Greece. 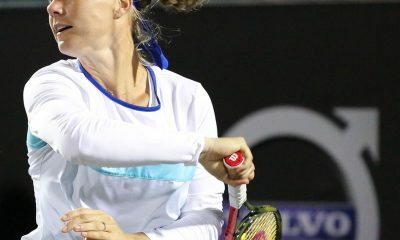 The Brit, 27, looked to be the weaker player in the opening set against the rising star from Athens, who struck the ball cleanly and took her chances well. 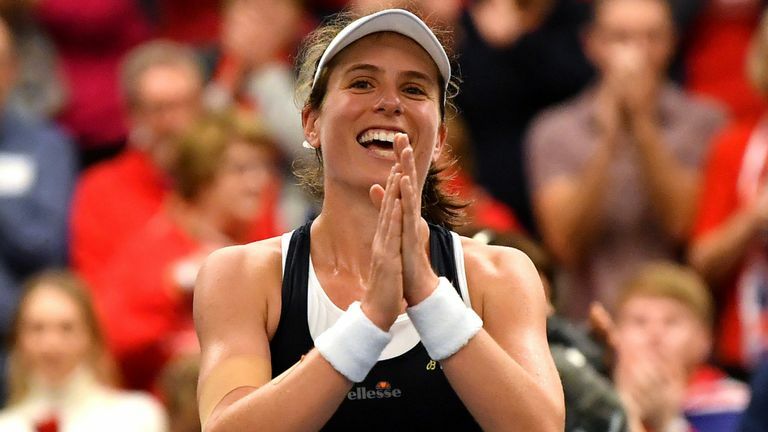 However, the World No.39 is an experienced Fed Cup campaigner by now, and she turned the match around very impressively to get the win for her team. Early in the second set, the Brit’s prospects looked bleak as she immediately went down a break and seemed a little disconsolate. But if Konta was feeling pessimistic, she shrugged off those negative thoughts quickly and battled her way back into the set. The 2017 Wimbledon semi-finalist broke Sakkari twice in a row to move 4-1 ahead. She then almost won her fifth consecutive when she had four break points on the Greek’s serve. However, the World No.39 hung on, despite a disagreement with the umpire, and managed to put Konta under pressure in game seven. The Brit held firm, and then broke Sakkari again to take the set 6-2 and send the home crowd into raptures. Both players gave it everything they had in the decider and the first five games took over 20 minutes to complete. But then Konta took charge as she broke the Greek and quickly finished off the set 6-3. Katie Boulter was also given a tough test by Valentini Grammatikopoulou in the opening singles rubber of the tie as she recovered after losing the second set to win 6-3 4-6 6-3. The British No.2 made an excellent start to the match. She broke immediately and served well to win it comfortably in just 34 minutes. However, the Greek produced an inspired fightback in the second set and it soon became apparent that Boulter had a real match on her hands. When Grammatikopoulou went 2-0 up in the decider, the situation looked dire for the Brit. But she never gave up, and soon earned a couple of break points in game four. The World No.171 saved them both, along with two more, before Boulter eventually took the fifth to level the match. She then ground out a hold to move 3-2 ahead. Unfortunately, her delight was somewhat marred by an unsavoury row involving Grammatikopoulou, Greece Captain Anastasios Bavelas and the umpire about what the player believed were ‘unfair’ line calls. Now the momentum was with Boulter. She used it well to break the Greek again in the sixth game, and then held her nerve to secure two holds and seal a vital win. The doubles had a tough task to try and live up to those dramatic singles matches, but Katie Swan and Harriet Dart performed impressively again to beat Anna Arkadianou and Despina Papamichail 6-1 6-4. In the other Pool A tie, Hungary eased to a 3-0 win over Slovenia to set up a shoot-out for top spot with Great Britain on Friday evening. Dalma Galfi gave her team the perfect start with a 6-1 6-4 thrashing of Kaja Juvan, Anna Bondar backed that result up with an impressive 4-6 6-1 6-4 defeat of Dalila Jakupovic and Reka-Luca Jani and Adrienn Nagy completed the whitewash by beating Nina Potocnik and Nika Radisic 7-6(3) 4-6 6-2 in the doubles. Croatia beat Georgia 2-1 to set up a Pool B decider with Serbia, but they almost paid for their decision to allow their best player Donna Vekic to sit out the tie and rest. The tie started well for Croatia as Ana Konjuh beat Mariam Bolkvadze 6-4 6-3. But then Jana Fett took Vekic’s place and lost a marathon match 4-6 6-3 7-5 to Ekaterine Gorgodze. Consequently, the Croatians asked Konjuh to join Daria Jurak for the deciding doubles. However, it did not look good for them when they fell 3-1 behind to Gorgodze and Oksana Kalashnikova. To their immense relief, Konjuh and Jurak found their form and levelled the set at 5-5. Then Konjuh turned on the style as she hit a series of thunderous winners and excellent touch shots around the net to help her team win eight of the next nine games and close out the match 7-5 6-1. In the other Pool B tie, Serbia thrashed Turkey 3-0. Ivana Jorovic beat Cagla Buyukakcay 6-2 6-3, Aleksandra Krunic edged out Pemra Ozgen 3-6 6-4 6-2 and Krunic and Olga Danilovic eased to a 6-2 6-3 win over Berfu Cengiz and Ipek Soylu in the doubles. Great Britain will host Kazakhstan in the Copper Box Arena in April in their World Group II Play-Off tie. 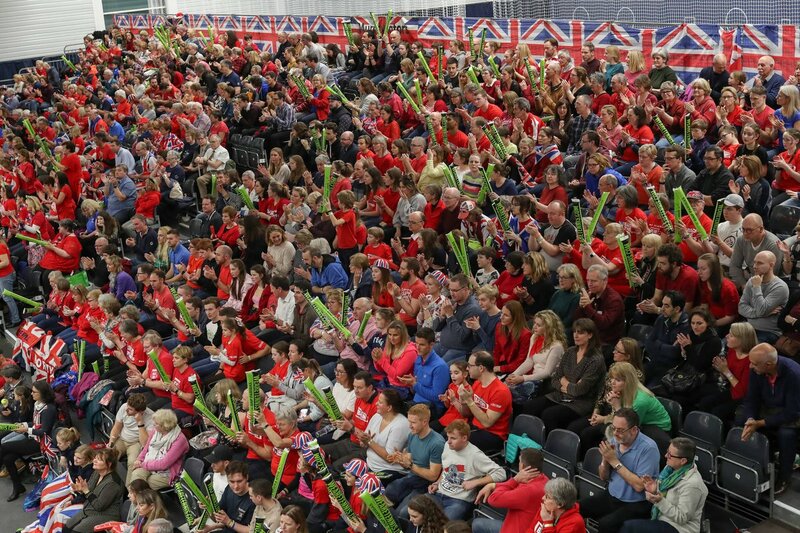 The Copper Box Arena will host Great Britain’s historic Fed Cup World Group II tie against Kazakhstan in April. The venue was announced on Thursday afternoon as Great Britain prepare for a historic World Group II tie against Kazakhstan in April. The Copper Box Arena hosted some Olympic events in 2012 and has a capacity of 5,800 as Great Britain look to build on the momentum they picked up in Bath in February. It is located in Hackney, London not too far from where Great Britain’s Fed Cup captain, Anne Keothavong, grew up and has stated the importance of April’s tie, “It’s very special to come back to my home borough of Hackney,” she said at a visit to Clapton Girls Academy. “Having grown up and started playing tennis here, I never dreamt that one day I would be coming back and leading the British team in what is the world cup of women’s team tennis. “Looking ahead to April, words can’t describe the sense of anticipation we are going to have playing our first World Group play-off at home. The tie will take place on the weekend of the 20th and 21st of April with tickets expected to be priced at around £12. This match is expected to be close with not much separating the four singles players involved. After waiting 26 years for a home tie, Great Britain will have a second tie in two months as they face Kazakhstan in April’s World Group II Play-Offs. After hosting some Zone Group I Europe/Africa action in Bath and successfully qualifying for the World Group II Play-Offs, Great Britain have been handed another home tie. 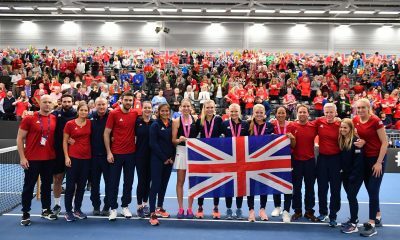 The Brits will face Kazakhstan in April with the winners getting promoted to the second tier of women’s team tennis, a historic occasion for both nation. This tie along with the other World Group II and World Group play-off ties will take place on Easter weekend between the 20th and 21st of April. There is strong rumour that the tie could be played at the Copper Box Arena in London although that will be confirmed next week. Meanwhile the pick of the other ties sees a strong Russia team host Italy while either the Netherlands or Japan face relegation to Zone Group I.
Czechs Look To Bounce Back. In the World Group Play-Offs draw the Czech Republic were handed an easy home tie to Canada as they face unchartered territory in April. The defending champions will play their first play-off tie since losing 3-2 to Romania in an exhilarating tie in Ostrava which was their first defeat on home soil for ten years. 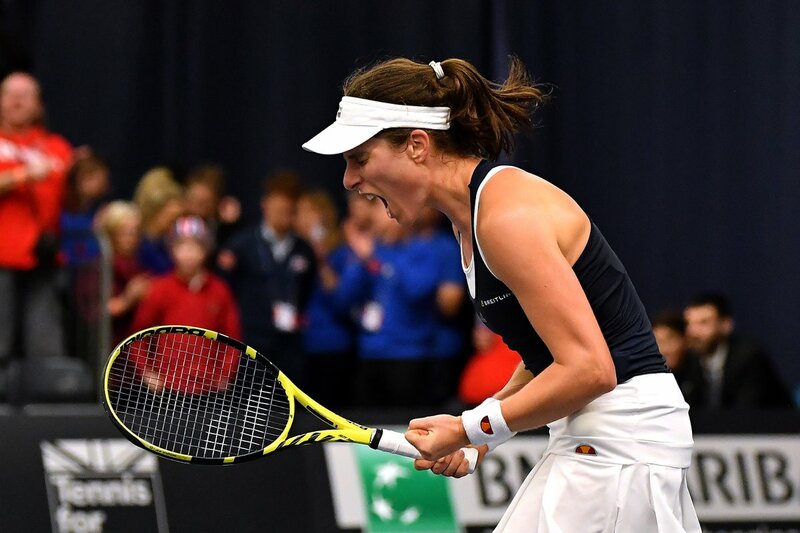 While the other 2018 Fed Cup finalists USA will host Switzerland and Latvia host Germany in a historic tie for the hosts as they look to make the World Group for the first time in their history. The former world No.1 has her eyes set on winning the team competition this year. 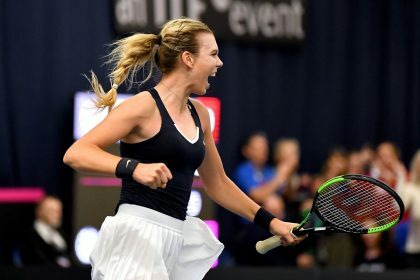 Reigning French Open champion Simona Halep has pledged to fully commit herself to the Fed Cup after helping guide Romania to a shock win over the weekend. Halep recorded wins over Katerina Siniakova and Karolina Pliskova during her country’s surprise 3-2 win over heavyweights the Czech Republic. A team who has won the title in six of the past eight years of the competition. The deciding win was clinched in the doubles when Romania’s Irina-Camelia Begu and Monica Niculescu defeated Siniakova and Barbora Krejcikova 6-7 (2-7) 6-4 6-4 in a match that lasted just under three hours. “It was my biggest and best win in the Fed Cup and to win both rubbers against the Czech Republic means a lot to me because they have such a big history in this competition,” Halep told reporters following her win over Pliskova. Romania now finds themselves in the semifinals of the competition for the first time since 1973. Last year the team defeated Canada in Group II and then won their play-off tie against Switzerland to graduate to the top tier of the competition. They have a winning 6-3 record in the Fed Cup since 2015. Reflecting on the latest triumph, Halep believes it will help inspire the next generation of players in her home country. During an interview with Telekom Sport on Sunday, the former world No.1 say she will ‘give her all’ to the team this year. “It was a very tensed match, it was even harder in the stands. I was very nervous. Monica asked me before if I want to get in court, but I told her she is better.” The Romanian Journal quoted Halep as saying. “We all made a huge effort for this game. We played against a big champion, Czech Republic. the girls are extraordinary, they left their heart on the court, so they managed to win. Hoping to reach the final for the first time in history, Romania will take on France in the semi-finals in April. A country they last played back in 1976 at the Spectrum Stadium in Philadelphia, America. France defeated Belgium 3-1 in their quarter-final tie. The semi-final tie will be held in France at a yet to be confirmed venue. In the other semi-final, Australia will take on Belarus.